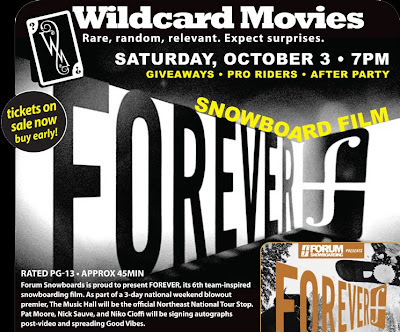 Forum Forever movie premier at the Music Hall in Portsmouth, NH on October 3. The movie starts at 7pm but be sure to get here early (around 5pm) to enjoy a few tasty beverages at the newly renovated bar in the theaters lobby. There will be an endless amount of prizes being raffled off before the film and EVERYONE attending the premier will be walking away with 2-for-1 vouchers for both Loon and Waterville Valley! Free stuff, hell yeah! After the movie walk across town to the Forum and Red Bull after party at the Wet Bar, downstairs at the Page. Expect an amazing DJ, stiff drink and the hottest bartenders around! Forum Forever and the Loon Mountain Park Video will be looping the flat screens at the bar the entire night. It’s going to be a huge turn out so pre-buy your tickets today!